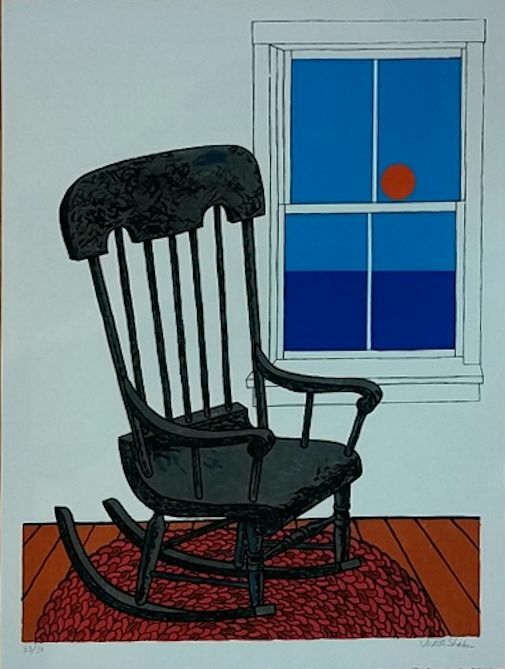 Boston Rocker Serigraph 26.00 in. x 20.00 in. 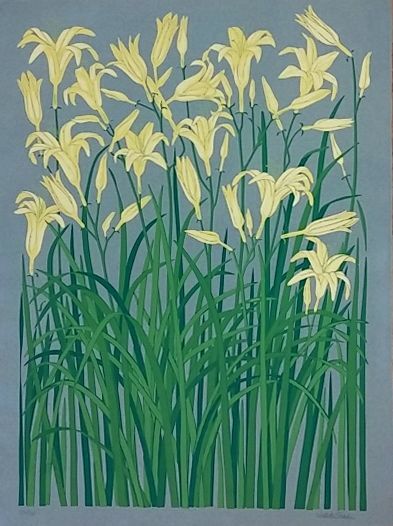 Day Lilies Serigraph 28.00 in. x 21.00 in. 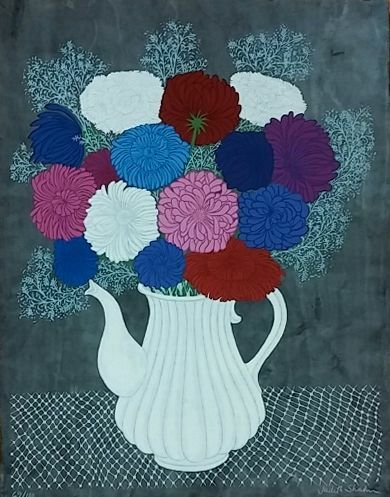 Fall Flowers Serigraph 21.00 in. x 17.00 in. 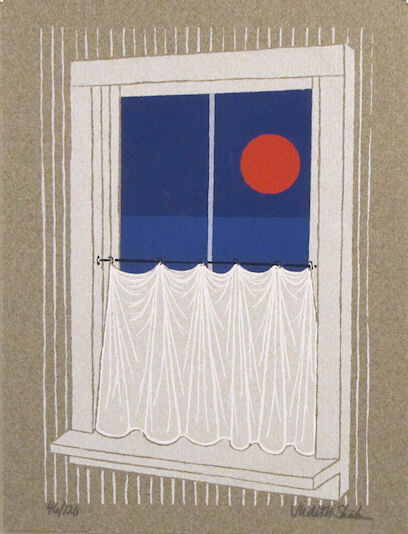 Double Window Serigraph 21.00 in. x 28.00 in. 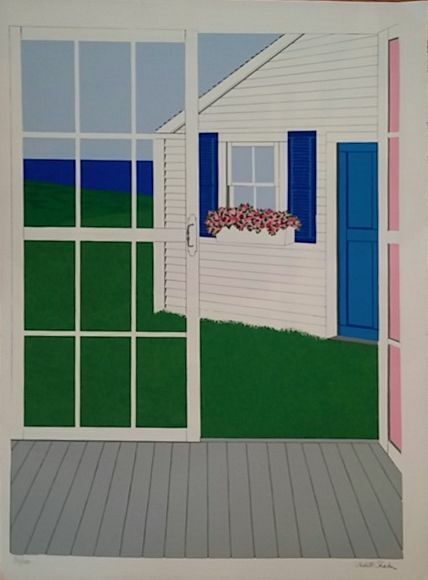 French Doors Serigraph 30.00 in. x 22.00 in. 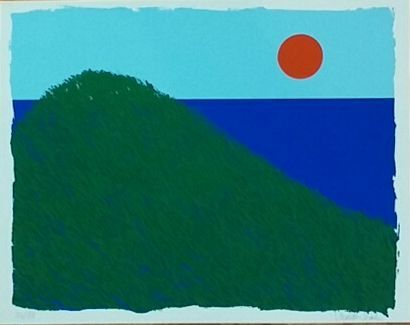 Summer Landscape Green hillside Serigraph 12.00 in. x 16.00 in. 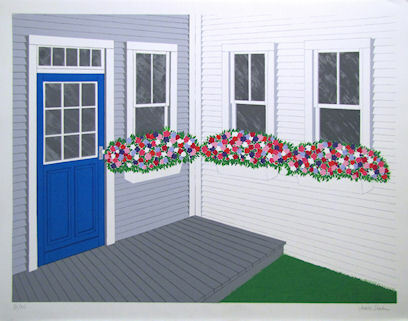 Window Box with Petunias Serigraph 19.00 in. x 25.00 in. 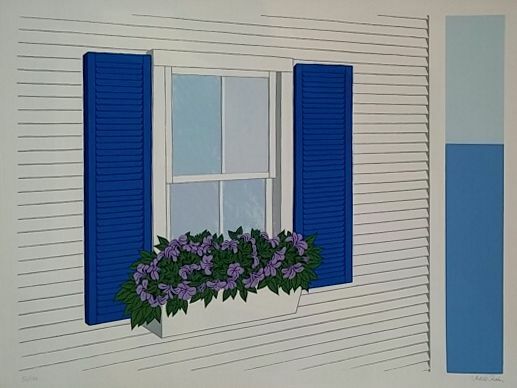 Window Box with Petunias Serigraph 22.00 in. x 30.00 in. 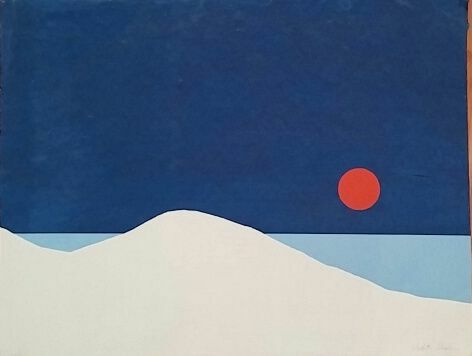 Winter Sunrise4 Serigraph 17.00 in. x 22.00 in. 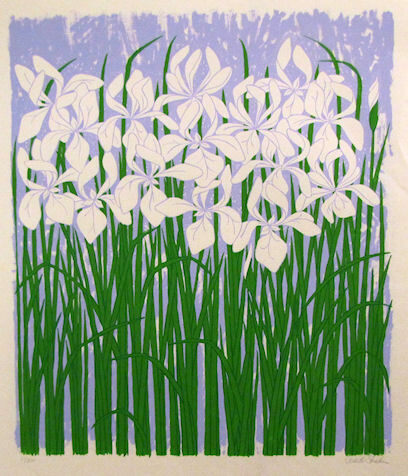 White Irises Serigraph 22.00 in. x 20.00 in. 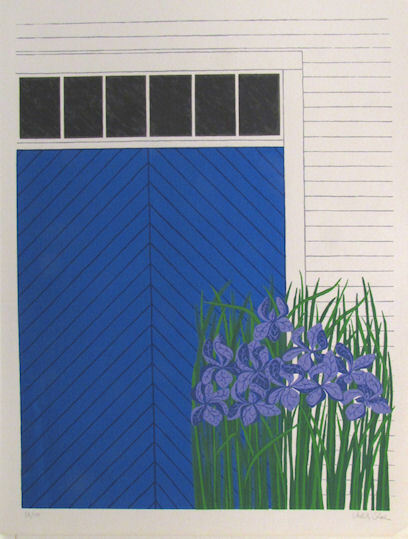 Irises III Serigraph 26.00 in. x 20.00 in. 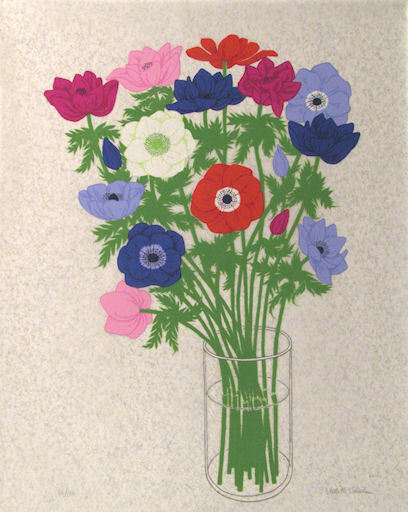 Anemones II Serigraph 26.00 in. x 19.00 in. 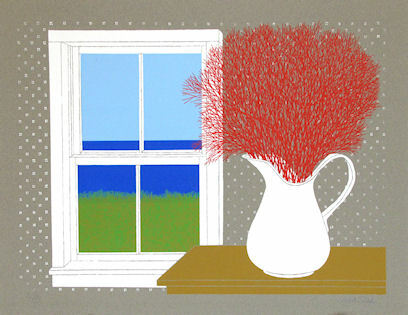 Still Life with Red Branches Serigraph 20.00 in. x 26.00 in. Yellow Leaves Serigraph 20.00 in. x 26.00 in. Dory Serigraph 15.00 in. x 20.00 in. 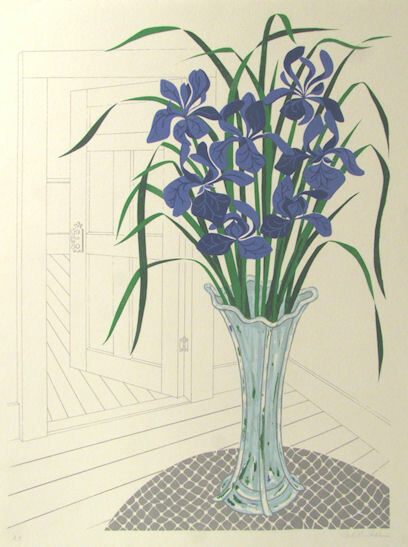 Interior with Irises Serigraph 26.00 in. x 20.00 in. 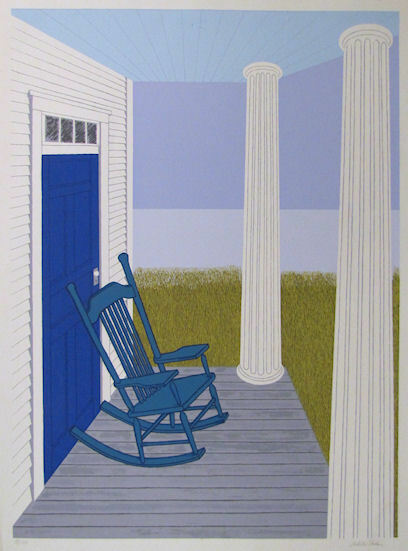 Porch Rocker Serigraph 30.00 in. x 22.00 in. 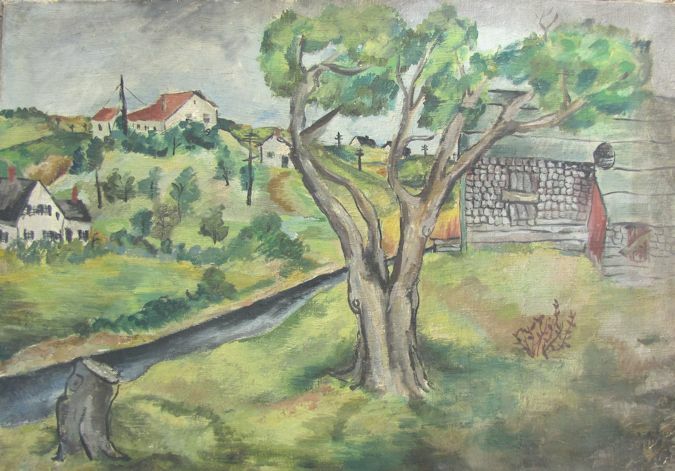 Vintage 1940's 1 Watercolor 13.00 in. x 18.00 in. 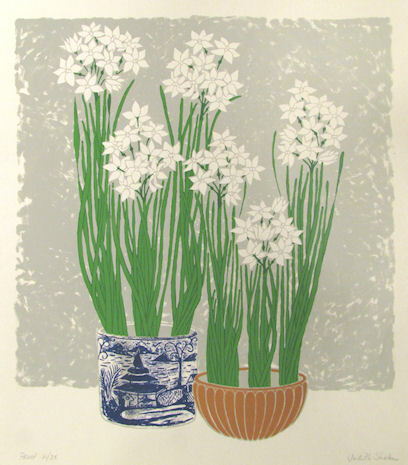 Paperwhite Narcissi Serigraph 22.00 in. x 20.00 in. 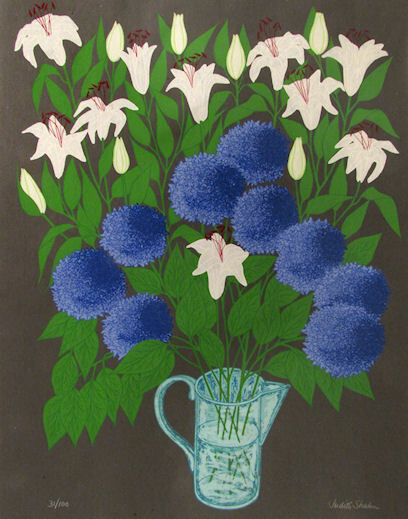 Lilies and Hydrangeas Serigraph 25.00 in. x 20.00 in. 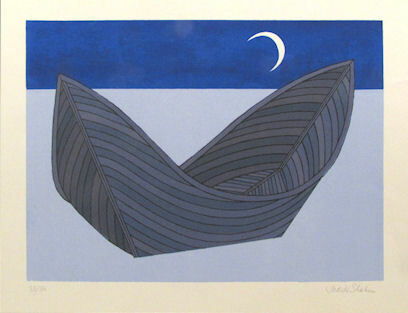 Full Moon Serigraph 5.00 in. x 7.00 in. 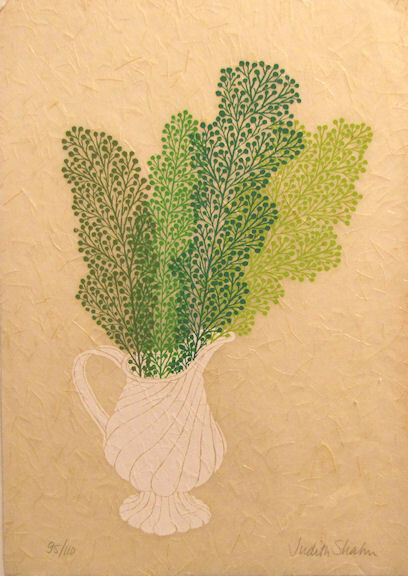 Weeds Serigraph on Rice Paper 10.00 in. x 15.00 in. 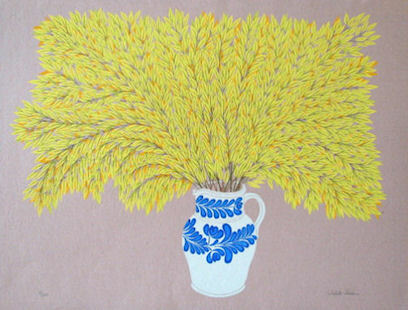 Dried Flowers Serigraph 18.00 in. x 24.00 in. 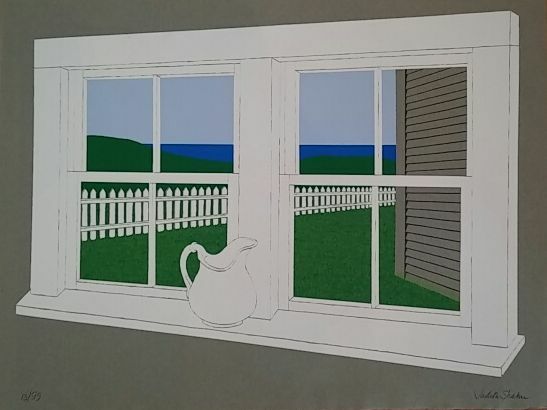 Window Boxes Serigraph 22.00 in. x 30.00 in. 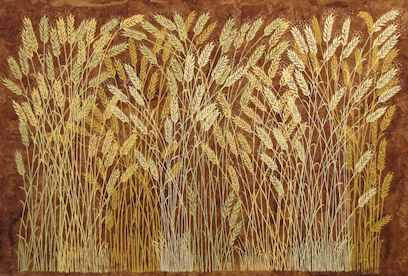 Wheat on Bark Paper Serigraph 17.00 in. x 24.00 in. 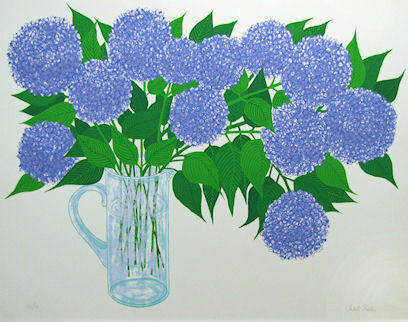 Hydrangea Serigraph 22.00 in. x 30.00 in. 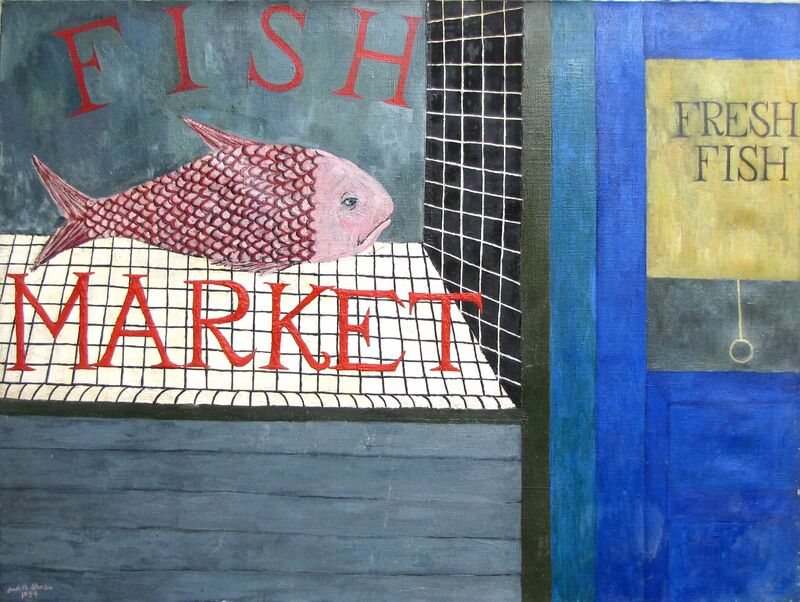 Judith Shahn (1929-2009) was born in Paris to the artist Ben Shahn and his wife, Tillie Goldstein. 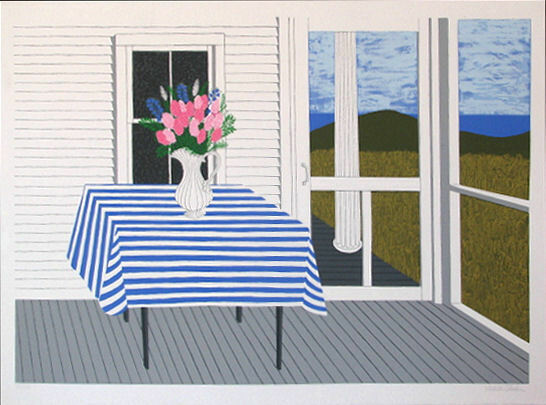 She lived in New York City and spent summers in Truro, Cape Cod, Massachusetts. 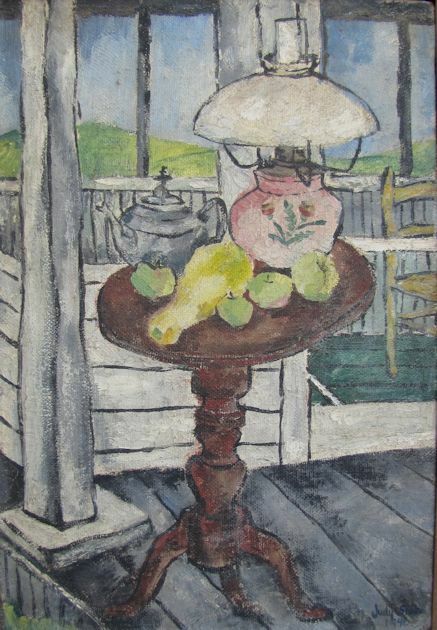 As a small child Shahn painted alongside her father and as a young artist she took life classes with the painter Moses Soyer. She attended Olivet College, Michigan, and graduated from Mexico City College in 1949. 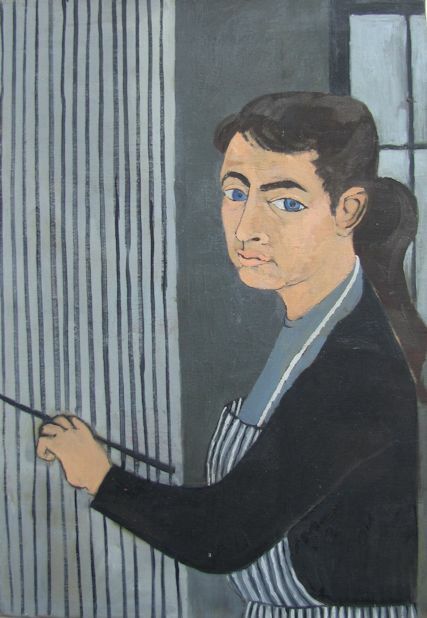 She was a painter, draughtsman, printmaker, and graphic artist. Her drawings appeared in The New Yorker magazine from 1958 to1992, as well as in Harpers, The Nation, Gourmet, and others. 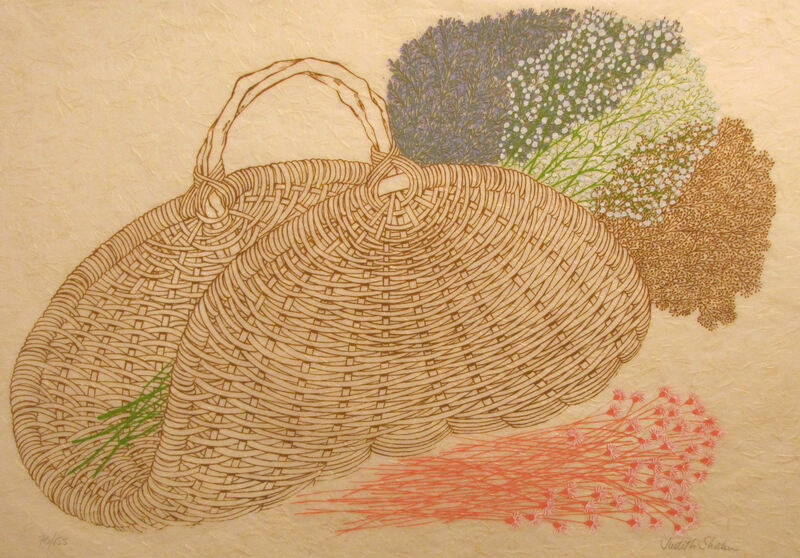 Starting with a show at the Gallerie Beatrice Viggiani, Rome, Italy, in 1964, there have been more than seventy one-woman shows of work by Shahn. 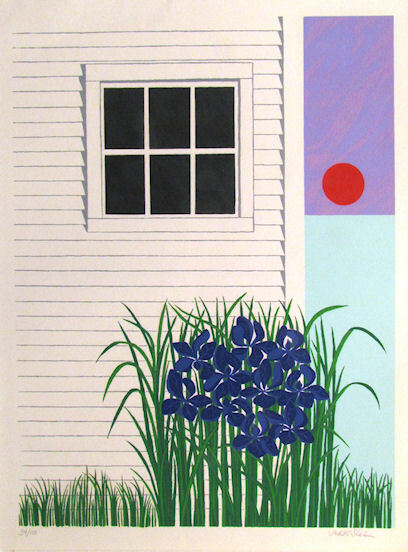 The Provincetown Art Association and Museum held an extensive retrospective in 1996; their catalogue remains a significant monograph on the artist. 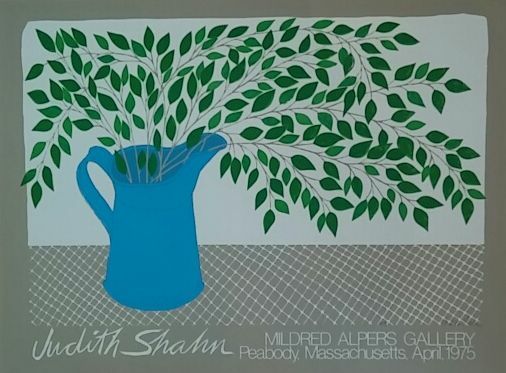 Further, in recognition of the artist’s donation of a complete archive of her serigraphs....... Judith's crisp pesonalized images have been popular at Cove Gallery and for many Cape Cod customers for over 20 years.